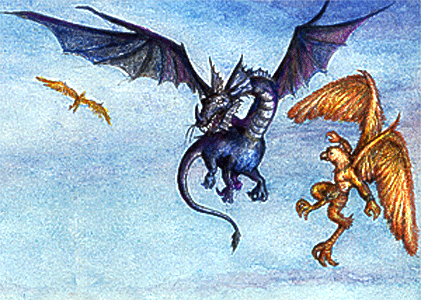 The primary inhabitants of Over Earth are the dragons, the titans, and the eagle lords. Long ago extinct, or so it is thought, dragons are the stuff of myth and legend in Ruin Mist. Stories say dragons are a hundred times the size of man and that titans rode from the heavens upon their backs. 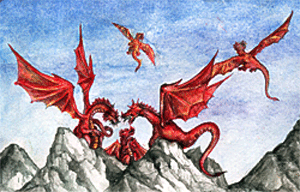 The only true facts regarding dragons, recorded in an early text, is that there were once many races of dragons and each was as unique and distinct as men, elves and dwarves. 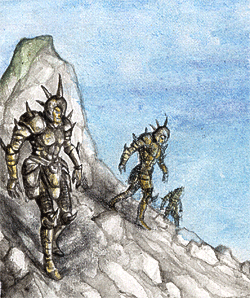 Over-Earth is the ancestral home of the dragon races. Of the Eagle Lords, it is said that eagles once looked more like men than birds. Known for their great wisdom, able to speak, to fight and to fly, they were formidable allies and enemies. Many clans of the great eagles existed. One of the greatest clans was the Gray Clan, and their mightiest warrior, their liege lord, Ayrian, ruled the skies over the Rift Range for hundreds of years. Titans are a mysterious and secretive race of super giants that inhabit Over-Earth. Their time of power and rule came before the dawn of the First Age. During the Great Purge, the titans were overthrown and thus began the First Age. In many parts of the kingdoms, titans are remembered as wicked, foul and evil, but there are those who say this is a great misjudgment, for the greatest of all titans, Ky'el, is the one who gave men, elves and dwarves their freedom.